We know how it goes. You were planning on taking the WWE by storm. You were going to get totally ripped and rise to the ranks of champion. You were going to body slam Brock Lesnar. You were going to give Roman Reigns a thumping in the ring. And you were going to wear that champion belt with pride. You were going to be the next John Cena. Of course, real life got in the way. Maybe you just couldn’t get to the gym every single day of the week. Maybe the McMahon family had it out for you and made it so you couldn’t get a good foothold. Heck, maybe you just didn’t feel like fighting every single jabroni who wants to step up to you. Well, that doesn’t mean you should give up your dream of becoming the next John Cena. Never give up! All you need is this officially licensed WWE costume and a fiery attitude. 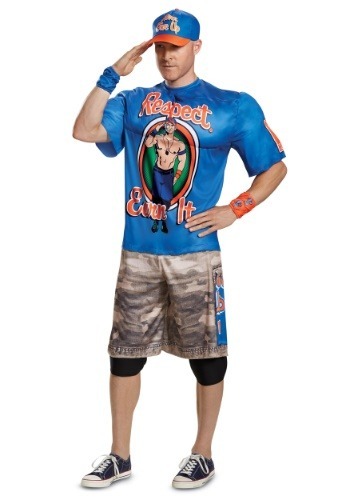 This adult John Cena costume brings you the look of the iconic WWE star. The costume comes with a muscle chest shirt that has padding in the chest and arms to give you a buff and tough look. You don’t even need to step foot in the gym! The shirt is blue with “Respect. Earn it” printed on the front, along with a large image of John Cena himself. The included baseball cap is a matching blue color with “Never Give Up!” printed on the front. The costume also comes with a pair of camo shorts that finish off the look. Once you have this on, you’ll be ready to take your rightful place as the champion of the WWE. The only thing missing from this outfit is hustle, loyalty, and respect, which you are more than qualified to provide!